With its famous aquarium and striking coastline, Monterey makes a wonderful day trip, weekend getaway, or stop along a California Coast adventure. It was an ideal first leg of my San Francisco-San Diego journey. Getting There: The train from San Francisco to Salinas, in Monterey County, takes just under three hours (from $33). From there, Amtrak’s free connector bus gets you the last 20 minutes to Monterey. While this stretch of the journey isn’t along the coast yet, you do pass through some vintage NorCal scenery, as the train shoots between the Santa Cruz mountains, through the green garlic fields of Gilroy, the abandoned ghost town of Drawbridge and the rolling green Pajaro Gap. Best of all, the Coast Starlight is a double-decker train with an observation car that allows you to sit facing out and soak in the view. (Note: If you’re only doing this leg of the trip, you can alternatively take the Capital Corridor train to San Jose, plus a connector bus to Monterey, which gets you there quicker, in just over two hours total). 1. Grab a set of wheels from Bay Bikes (from $8/hour) in downtown Monterey and hop on the Monterey Bay Coastal Trail—also ideal for walking or running. 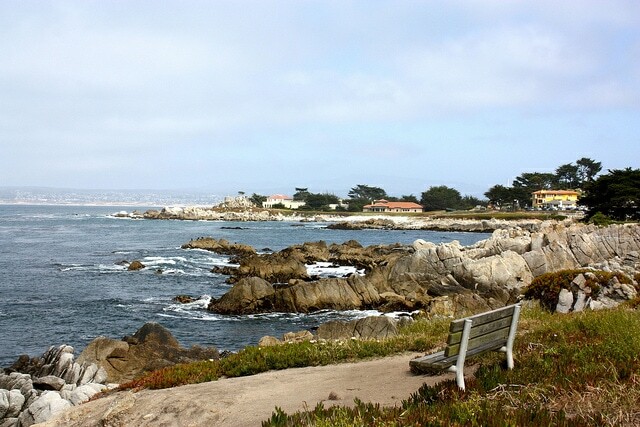 The oceanfront path is one of the most scenic in Northern California, and is relatively flat as it continues through Pacific Grove, then slightly uphill to Sunset Drive as the road curves around the peninsula for perfect Pacific views (and of course, sunsets). 2. The town’s main attraction, the Monterey Bay Aquarium, is worth the hype (it’s often called the best in the world). Inside you’ll find giant Pacific octopi, penguins, sea turtles, and an impressive new jellyfish exhibit—plus views of orcas and otters from the deck. The literally eye-popping admission price ($34.95) is enough to give pause, but you can take comfort in knowing proceeds go to ocean conservation efforts. 3. Steinbeck fans will be disappointed to find the author’s famed Cannery Row now home to nothing more than tourist traps and knickknack stores. It’s hardly worth even seeing. Instead, head the other way from downtown to Monterey State Beach, a crowd-free stretch of sand where you may also spot otters and seals. 1. Halfway up Municipal Wharf 2 (the drab-looking pier adjacent to tourist-clogged Wharf 1), Loulou’s Griddle in the Middle is a stamp-size greasy spoon serving inventive, ocean-fresh breakfast options like squiddle and eggs (breaded calamari steak topped with runny fried eggs). 2. Monterey’s Fish House is worth a cycle (or meander up Monterey State Beach) for catch-of-the-day dinners like wood-roasted Pacific salmon, with a locals-only crowd. The bayfront Portola Hotel and Spa (rooms from $179) is the only Silver LEED-certified hotel between L.A. and San Francisco, and eco-friendly details go beyond lip service, including native landscaping, meals approved by the Monterey Bay Aquarium’s Seafood Watch Program at the on-site restaurant, and compostable cups at Jack’s Restaurant and Peter B’s Brewpub.